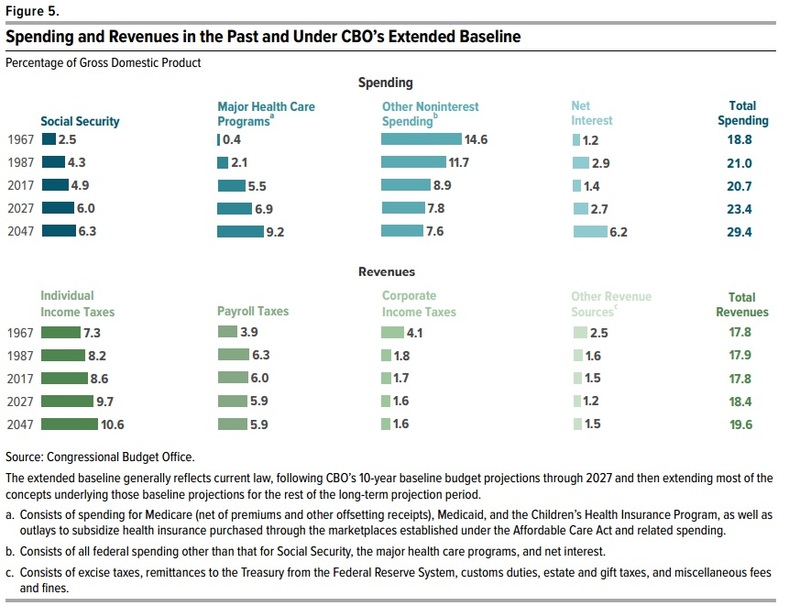 Interestingly, even CBO openly acknowledges that rising levels of red ink are caused solely by the fact that spending is projected to increase faster than revenue. And it’s also worth noting that revenues are going up, even without any additional tax increases. The bottom part of this chart shows that revenues from the income tax will climb by about 2 percent of GDP. 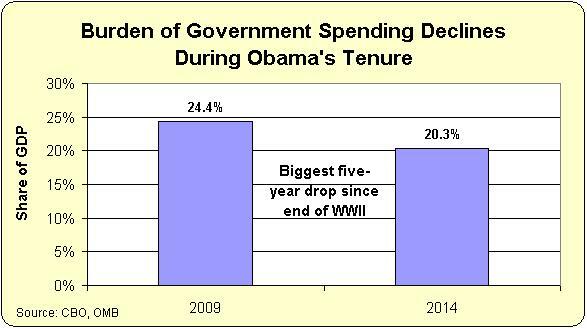 In other words, more than 100 percent of our long-run fiscal mess is due to higher levels of government spending. So it’s absurd to think the solution should involve higher taxes. This next image digs into the details. 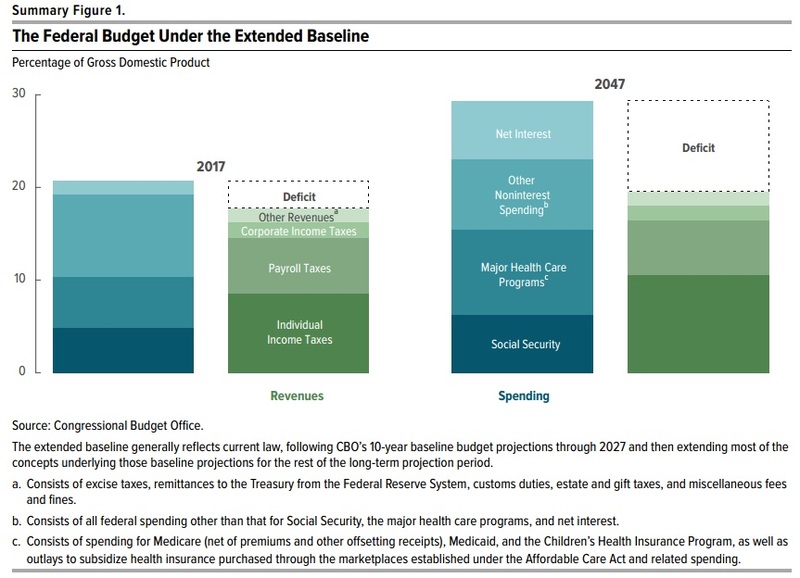 We can see that the spending burden is rising because of Social Security and the health entitlements. 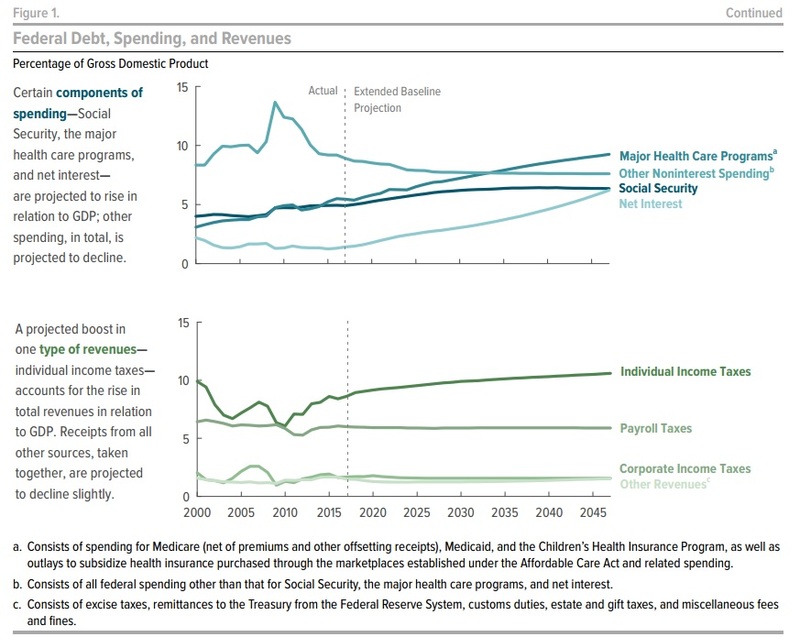 By the way, the top middle column on “other noninterest spending” shows one thing that is real, which is that defense spending has fallen as a share of GDP since the mid-1960s, and one thing that may not be real, which is that politicians somehow will limit domestic discretionary spending over the next three decades. This bottom left part of the image also gives the details on built-in growth in revenues from the income tax, further underscoring that we don’t have a problem of inadequate revenue. 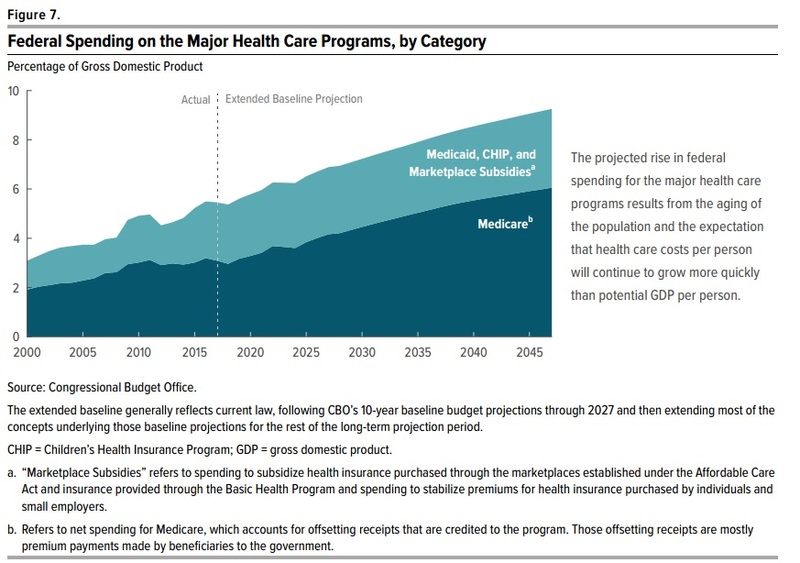 Here’s a chart that shows that our main problem is Medicare, Medicaid, and Obamacare. 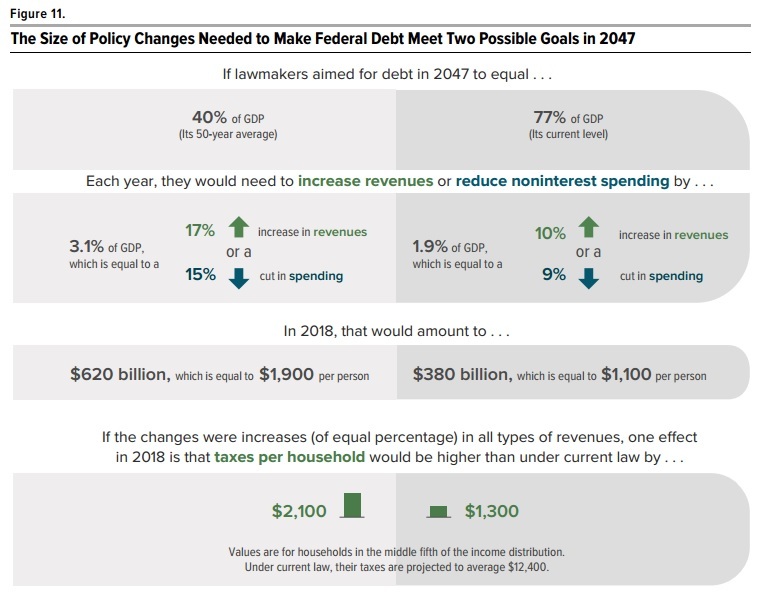 Last but not least, here’s a graphic that shows the amount of fiscal policy changes that would be needed to either reduce or stabilize government debt. 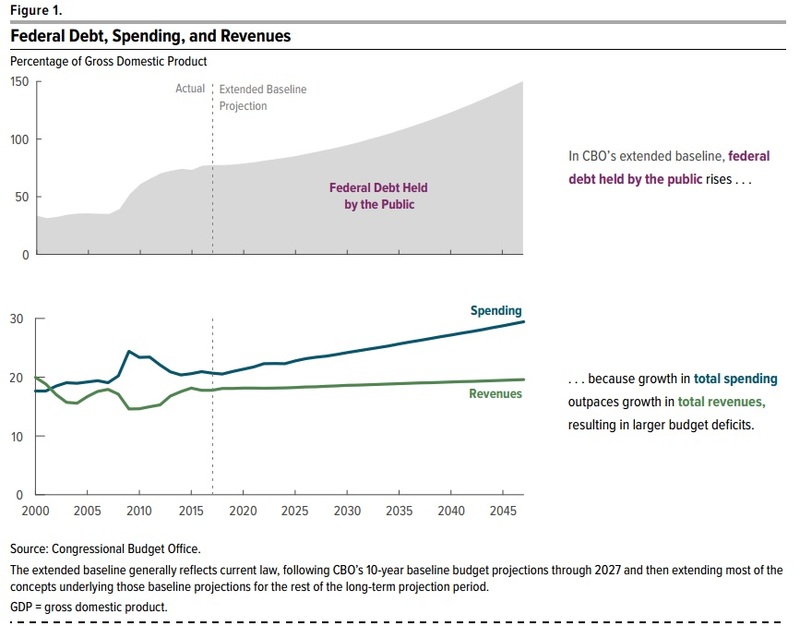 I think that’s the wrong goal, and that instead the focus should be on reducing or stabilizing the burden of government spending, but I’m sharing this chart because it shows that spending would have to be lowered by 3.1 percent of GDP to put the nation on a good fiscal path. Some folks think that might be impossible, but I’ll simply point out that the five-year de facto spending freeze that we achieved from 2009-2014 actually reduced the burden of government spending by a greater amount. In other words, the payoff from genuine spending restraint is enormous. We need to invoke my Golden Rule so that government grows slower than the private sector. In the long run, that will require genuine entitlement reform. Or we can let America become Greece. We know for a FACT (go to the treasury website natonal debt to the penny) that FY 16 borrowing was $1.4 Trillion, not the announced 587 Billion. Also, any pie chart will show that entitlements made up 70% of the budget, defense 15% and other discretionary spending 15%. And Mitch, you should point that out every time you repeat their lies, or better yet, write an article explaining how the CBO “COOKS the Books”…. What’s really depressing is that with Republican control of both houses and the Presidency, it looks like business as usual.